I wasn't going to make the trip, I was going to save up for NY, but my wife warned me, this could be the last chance to see them, and that if they lost I'd blame myself, so I headed off from Raleigh to Morgantown. I generally HATE driving in WV, the radio you can receive is terrible, the interstate is too curvy, and you can go an hour sometimes without seeing a Burger King. I had hoped XM Radio would help, but between the mountains and the fact that my antenna isn't mounted well because the wires are in an ugly tangle, I kept getting dropouts. It was at least bearable once WLW would come in. I'm also more than a little irritated that XMRadio doesn't carry the ACC games in either NIT or NCAA tournament, because I was hoping to listen to the FSU game before, and the state post game. As it stood, I had to tune in wptf for post game and caught a few words every 30 seconds. I grabbed a room 30 miles south of Morgantown and because I wanted to watch a bit of the FSU/Mississippi State game. Normally when I go to a new arena I'd try to get there 90 minutes or more early to scope out parking and the ticket situation, but I cut it close this time. I thought the parking at Duke was tough, Morgantown is a complete mess. The traffic was awful and seriously, everyone just seems to park anywhere they can. I sat at an intersection for like 20 minutes waiting for the foot traffic to clear up, and during that, at least 10 SUVs, just left the street, crossed a big curb and pulled right into a lot bypassing the people checking permits. Starting at least a mile out, people are parking on both sides of the 4 lane road. The crowd seemed to arrive really early. I eventually had to keep driving beyond the arena about a mile and park within inches of the guard-rail on the 4 lane road, which left me so close to the 4 lane road that I had to wait a few minutes for cars to stop coming so I could open the door. Because time was short, I didn't really scout the ticket scene, but found a scalper pretty quick and got a $25 downstairs ticket. My guess is I could have easily found below $15 face for upstairs if I wanted. The arena is round, old. I won't call it a dump, just say that it is very old. The lone retired jersey isn't a jersey, but a big "44 Jerry West" sigh up in the corner. Also, really old, simple scoreboard. 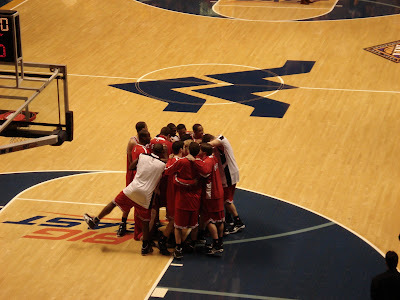 I guess there isn't a lot to do in WV because they really turn out, and ALL wear the colors. The place was probably 85% full, over 11K. The girls really turn out too, higher percentage than in NC, and almost all of them have all their teeth. I won't go into great detail to break down the game, since most of you saw it. Courtney was terrible, and we just didn't shoot well. The 1st half was the worst half of basketball I've seen all year. I sent a text message to a friend back in Raleigh who was watching, noting that there "was a reason these teams were in the NIT". Sidney's normal offensive play calling skills seemed to be of no use against the WV zone. Some random things that you may not have been able to see on TV. When Beilein and Lowe shook hands before the game, there was an extended conversation and some laughing. Would love to know what was said and if either brought up how close things came to Beilein having Sidney's job. There was an extra 3 minute delay before the start of the game waiting for TV, I guess FSU ran long. The players just sat on the benches waiting. Sidney spent 90% of one TV timeout with his arm around a ref talking about a missed call. The crowd was one of the nicest, most polite I've ever seen, until late in the 2nd half when it seemed like 3 or 4 questionable calls went State's way. Then came the "don't throw stuff on the floor" announcement. State came out from half-time with about 6 minutes before the start of the half. 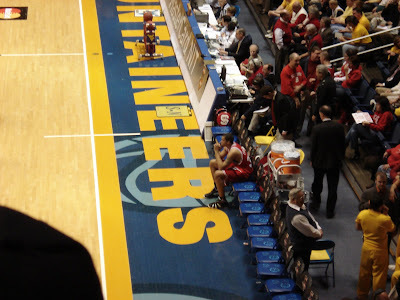 While State ran layups, Brandon Costner just sat alone on the bench. While McCauley wasn't effective in the game and Horner played pretty good, there were at least 6 or 7 times when Lowe called a play and Horner looked confused, had to get help from Gavin to know where to go or looked to the bench for them to point to a spot. You may remember that McCauley took a big charge late in the game. What you probably didn't see was about 10 seconds before that drive, Lowe whistles to get Ben's attention, then motions for him to lay off his man and drop back under the basket. Great Run to end the year. I'm sat to see Engin go, but the future sure looks bright. I'm a very proud West Virginia University graduate living in Raleigh, so I was excited to see that the Mountaineers and the Wolfpack were finally going to meet! Great game. I would have been happy about either outcome, but because I'm an alumni (and graduated in that OLD building), I was happier with the WVU win. Glad you made the trip! 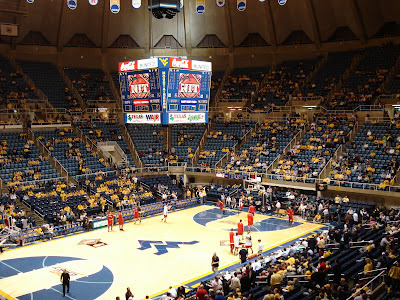 Morgantown's a little gem of a college town! Wish I had gotten there before dark to look around the town. It looks like a neat area. The home court and the crowd was a big advantage.